We are pleased to announce our partnership with Motor Marc Lacourciere and this true one of a kind masterpiece. This is what Marc has to say about donating this high value collectible to Bikers Against Bullies USA. "Six years ago, my friend Fred "Flash" Van de Perre, came to me with a great idea about creating a non profit organization to help young people that are being bullied throughout the country. After our conversation, I reflected on my personaI experiences of being bullied as a child and how I was a victim of this terrible crime that still effects so many people to this day. My parents tried their best, talking with teachers and other parents, but after a few weeks the bullying continued. Friends were hard to make because no one wanted to be seen with the "unpopular kid" that everyone made fun of, and surely they didn't want to be the next target of constant ridicule. My escape was anything with a motor, I had a trail bike that I would ride for miles. Jumping high hills and riding in and out of ditches would release all of the stress and sadness I had that was caused by my tormentors. I became really good at riding my bike and it enabled me to meet other bikers and form a friendship outside of the school walls. With my new friends encouraging me, and having a little more confidence, my artistic talent flowed through me more than ever before! I eventually learned that the people bullying me had difficulty in their school work and art assignments and that my talents in art had begun to make me popular. Even though I was tormented, I believed in forgiveness and that I was given this talent to help others in their time of need. I was excited to learn that a group of bikers had come together and formed such an amazing organization as Bikers Against Bullies USA. I knew I had to be a part of it and help in the one way I knew I could do my best. 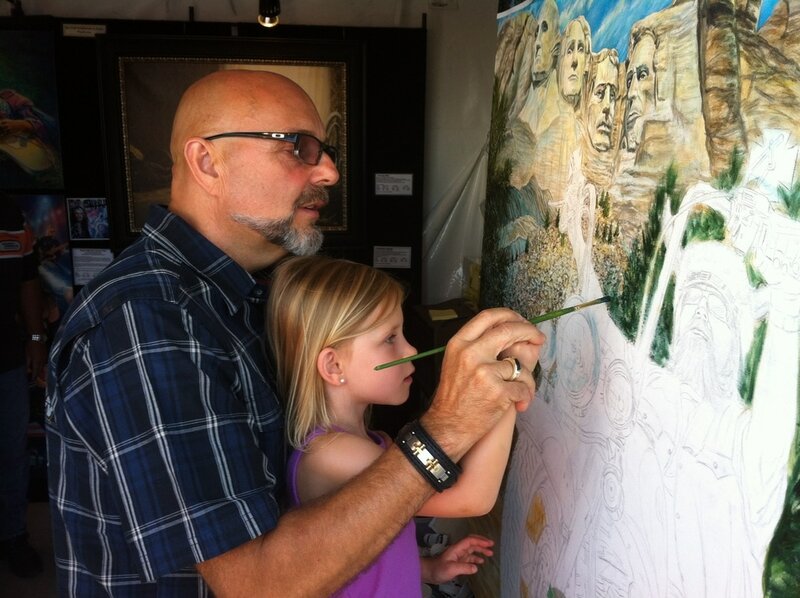 I am proud to donate an original painting. 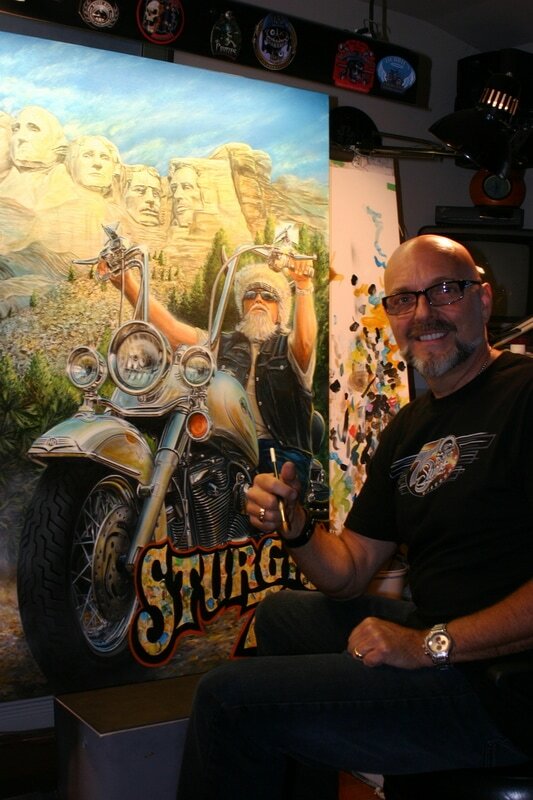 This special interactive painting which was done for the Sturgis 75th Anniversary illustrates bikers and kids which I thought seemed perfect fit for this great cause. With the many charities that we help throughout the years, this particular charity hits home to me and with your support will hopefully hit a home run. I applaud Fred and all who are working for this organization. Unfortunately, through the power of social media, bullying doesn't end when you walk through your front door like it did for me when I was young. Children, teens and adults all around us need to stand up and take the next step in preventing bullying, by protecting one another so they can focus on their future dreams. If it wasn't for that trail bike, my biker friends and my art, I would not I would not enjoy the success I do today. As a parent of three children and three grandchildren. My wife and I always encourage our kids to talk about their challenges and to express their feelings whether they are sad, frustrated, mad or embarrassed. We love and will always stand behind them in every way. ​We all need to believe in this great cause and stand behind Flash, with Bikers Against Bullies USA. Join me, Motor Marc Lacourciere, in helping with this great cause."